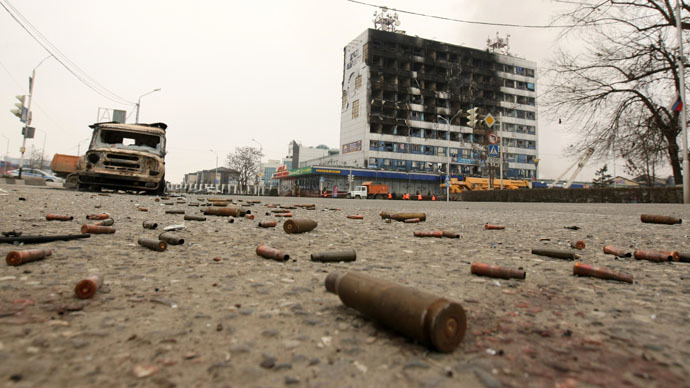 Ten police officers were killed and 28 injured during an anti-terrorist operation in the Chechen capital, Grozny, the National Anti-Terrorist Committee has reported. The operation prevented major terrorist attacks planned in the city, the committee said. “In the course of the counter-terrorist operation 10 local police officers were killed and 28 were wounded, having shown bravery while on civilian and military duty,”the National Anti-Terrorist Committee said in a statement. RT's video agency RUPTLY has obtained exclusive video of the last hours of the operation. The footage from the location shows a building on fire, with emergency services trying to put out the flames. The cameraman is at the scene of the fierce shootout between the security forces and the assailants. The close-up shows the shots hitting the building, and then intensifying. Later, shoulder rockets are used in the violent fighting, with people ducking and wincing at the sounds of incessant shooting. The incident started after midnight when a group of armed men traveling in three cars attacked a police checkpoint outside Grozny. Then the gang proceeded into the city and occupied the Press House building in the city center. Security forces immediately arrived at the scene and blockaded the Press House. An anti-terrorist curfew was imposed in the city. Also, additional measures were taken to liquidate terrorists who besieged a school building, the National Anti-Terrorist Committee spokesman said. The committee reports that the operation has now ended. Interfax reports that the body of a civilian has been found among the rubble of the Press House in Grozny. The civilian was an employee of a furniture store located in the building, according to a representative of the National Anti-Terrorist Committee.